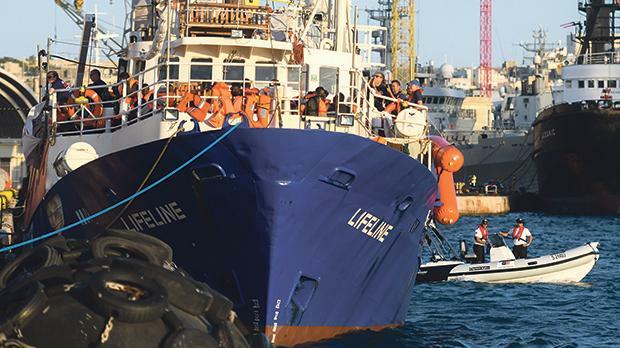 Transport Malta is causing unnecessary financial pressures on the operators of the impounded migrant rescue vessel MV Lifeline, their lawyers say. Transport Malta has asked the court to move the Lifeline from its present berth in Boiler Wharf to a private berth. The move was made to accommodate cruise ships, a spokesman for the vessel said. In a court application, the NGO disagreed with the request for the move, saying it was unfair they should pay to be berthed in another dock. The NGO would need to pay up to €150 a day to move to the private berth, lawyers Cedric Mifsud and Neil Falzon said. “If the ship is made to move and berth at quays belonging to private entities, it will sustain unnecessary financial pressures that will prejudice the ship and its owners,” they argued. Dr Mifsud pointed out that Transport Malta could continuously file applications to move the ship from port to port to make way for cruise liners. “In the meantime, the vessel continues to incur charges to abide by such orders,” he added. The lawyers representing the captain of the vessel, Claus-Peter Reisch, said the transport authorities should be made to pay instead. The MV Lifeline has been stuck in Boiler Wharf, Senglea since June, after the government impounded the vessel. The 234 rescued migrants aboard were allowed off the boat after an agreement with seven other European countries – France, Ireland, Italy, Portugal, Luxembourg, the Netherlands and Belgium – was reached. Prime Minister Joseph Muscat declined to say how many migrants each of the states had accepted. The Sunday Times of Malta reported that France took 52 migrants, Belgium six, Ireland 26 migrants and the Netherlands hosted 20. Italy did not take any.